C&A Brushware is a family owned company and was established in 1985 and now in 2015 celebrates its 30th anniversary as an Australian manufacturer and supplier of quality painting products. 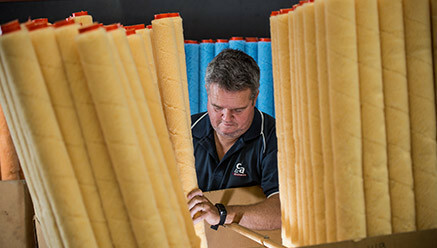 The modern premises located at Taren Point in southern Sydney is where administration, manufacturing and despatch takes places with an Australia-wide distribution network. The company is also expert and experienced in handling export orders and ‘’own brand” packaging. C&A Brushware is always expanding their range, seeking out the best and newest innovations in roller fabric from Europe and the USA. We source roller fabric that is suitable for specialised applications, for use by the home handyman, the professional painter, for marine, flooring, epoxy and industrial uses. Paint brushes are made from top quality bristle and filament and range in quality from handyman to professional painter standard and are made to the highest specifications, from the best quality raw materials. Always looking to increase the range of products, C&A Brushware also stocks a full range of painting accessories including paint scrapers, paint mixers, poles, snap blade knives, painter’s pads and our paint trays are also Australian made. C&A Brushware are proud to be the only remaining company to manufacture paint brushes and paint rollers in Australia, therefore our company can offer flexibility, can be innovative and can deliver specialised orders at short notice.